1989 BMW 325iX - BMW never promoted the 325iX. That's too bad, because it's a really good car. It seems like they just wanted to show that Audi wasn't the only German company that could build AWD cars. In North America, BMW sold less than 3000 325iX cars from 1988 through 1991. 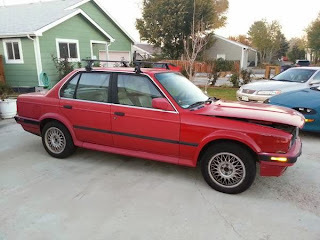 E30s are not unusually rust prone, but the ground effects on the iX caused them to rust more than the 2WD cars. Salt, mud and water got trapped behind these parts, where it was tough to get out. The most common place to see rust was behind the front wheel well. This car obviously has had at least one fender repaired or replaced. Check the rest of the car thoroughly for rust damage or repairs. The seller says the car is in "perfect running condition," but "possibly" has a "leak in (the) head gasket." OK, in my mind a blown head gasket takes the car out of the "perfect running condition" category, but I know what he means, so I won't argue over semantics. The seller is asking $2150.00, but is willing to listen to offers. Buy it right, do the work yourself, and for less than $3000.00 you will have a very cool classic car that can be driven all year round. Located in Denver, CO, click here to see the Craigslist ad. 1985 Merkur XR4Ti - These are good cars. Better than their reputation. The XR4Ti is a European Ford Sierra that was extensively re-engineered for the US market. It could have been a contender in the US, but early reliability problems and an old-school dealer network (Lincoln / Mercury dealers) that basically hated the car, doomed it. This one has had a lot of work done to it and appears to be in good condition. If you're looking for an affordable classic European sports sedan, but don't want a common Audi or BMW, this car is worth checking out. Located in Garrettsville, OH, click here to see the eBay listing. 1969 Corvair Monza - 1969 was the last year for the Corvair. A few years earlier Ralph Nader's book, "Unsafe At Any Speed" came out and trashed the Corvair. GM, instead of discrediting Nader's research - which was extremely flawed - decided to try to discredit Nader, the man. It turned out that while Nader was a lousy researcher, he was basically squeaky clean as a person. When GM's tactics became public, it made it look like they had something to hide and the Corvair was doomed. I owned and drove several Corvairs. (In order, a 1965 Monza 110 'vert, a 1966 Corsa Turbo 'vert, a 1962 Wagon - with a 140 and a Spyder dash, a 1968 110HP 'vert.) They were great cars. Fun and very safe to drive. 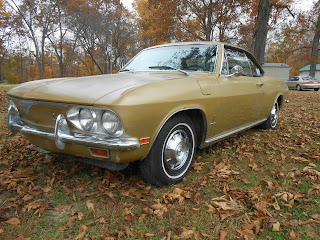 The differences between the 1969 Corvair and the earlier second generation Corvairs are minimal. Some slight trim changes. They were built in a separate area of GM's Willow Run, MI plant. They were essentially hand built cars. This Monza coupe has a 140 HP engine in it, which was a fairly rare option in 1969. It is a very good restoration candidate. Located in Louisville, IL, click here to see the eBay listing. I don't think Nader was ultimately responsible for killing the Corvair. I think the far greater sales success of the conventional Falcon as an economy car and then the booming success of the conventional Mustang as a sporty car made building the comparatively slow selling more expensive to manufacture Corvair a loser financially and that's why Chevy came out with the Chevy II and then the Camaro. GM's behavior towards Nader just exposed exposed corporate malfeasance. I think the Corvairs are great and the 2nd generation are among the best looking cars of the 60's. merkurs didn't sell because they were terrible cars. fine in euro trim but once ford u.s. monkeyed with it they ruined it. 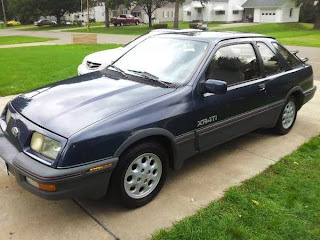 I had Merkur Scorpio in the early 90's and it was a really nice car, especially for what I paid for it; $1500, It did have what was basically a Bronco II engine and transmission but it sure was posh inside.